I couldn't resist getting three packets of perennials for £5. They are crowns of plants in loose dry compost in a plastic bag. 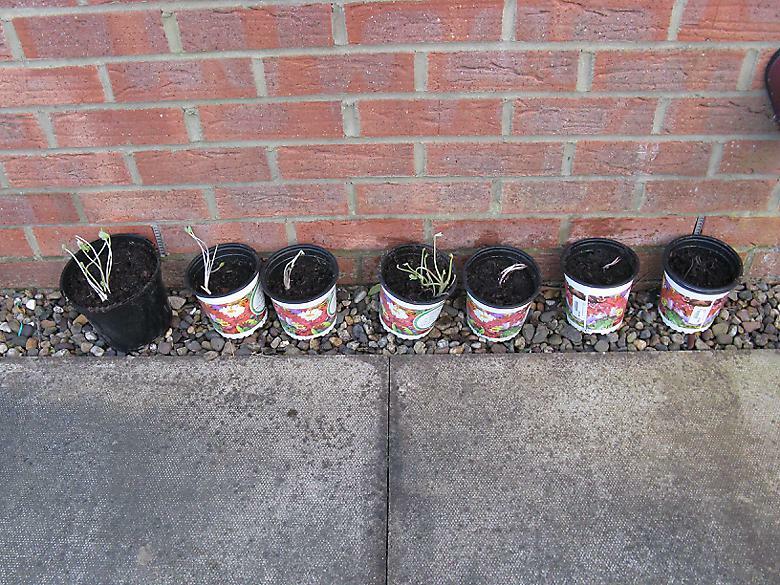 Last year I bought some delphiniums in similar packaging and by the time I came to plant them, they were almost completely indistinguishable from the compost. I planted them without much hope and indeed they did not grow. By gently tipping the bags to and fro I made sure that there were some signs of life in the ones I picked. 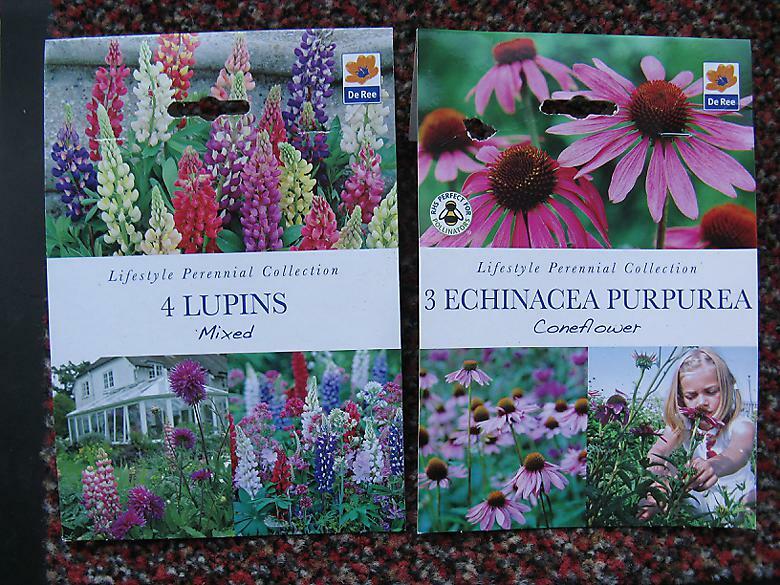 This post is about the Lupins and Echinaceas. The other packet was a Canna, which I will write about when I decide what to do with it. There were supposed to be four and that's how many there were, all had plenty of growth. Perhaps too much for this early in the year. 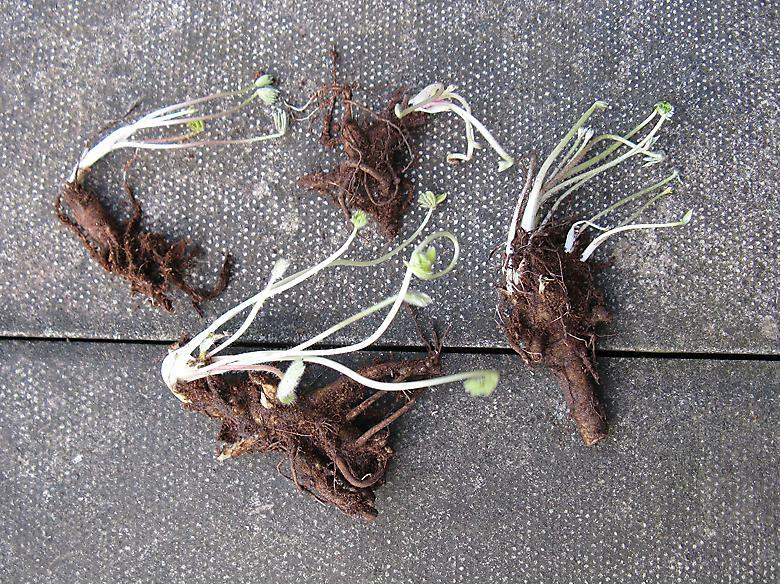 One had a very large root, there were two medium sized ones and one smaller than the rest. This was a packet of three, when I opened it there were two with obvious signs of life, and one that had no such signs. It will be interesting to see if it actually does grow. I put each one into its own 1L pot, the largest Lupin was too big so it went into a larger pot. I put them into pots, partly because I'm not sure where they are going yet, and also in case of very cold weather I have the chance to take them inside. This will be a series so you can follow the progress as the year progresses.